It’s been a challenging week. I have a freelance project I’m working on and it’s pretty high on the frustration level. Also this it’s the time of year, I usually escape to Palm Bay, with my writing friend Cynthia, for a week of R&R & Writing. But the folks sold the house over there so that is no more. To cut the whining to a minimum, I really needed to decompress but didn’t feel I had the time. That’s always a bad sign. Then it sunk in, Samhain (Halloween, Day of the Dead, et al) was on Monday this year. Mondays are my day off–I could do something. My favorite little ritual for the holiday is to go to the beach, wade or float in the water, and do some deep reflection on those no longer here. So, in the middle of the project from hell and a bit of prompting from Cynthia, I said, frack it all, and took the afternoon off and headed to the beach. Now, in Palm Bay, where I grew up, it takes a whole 15 minutes to get to the beach (Atlantic coast of Florida). Where I live now in the inland Tampa Bay area, it’s a good hour and a half to two hours to get to a decent beach. My favorite beach is Coquina Beach on the southern tip of Anna Maria Island (see embedded map). It’s my fav for a number of reasons. First, Anna Maria is just a funky little beach community, the kind that doesn’t really exist anymore in Florida. When I first started building the town of Bennett Bay, I had Anna Maria in mind. When I play “Where would I live if I won the lottery,” it’s about 50/50 between Anna Maria and St. Augustine. I really like Coquina Beach because it’s not nearly as crowded as the beaches in Pinellas county, the north side of the Bay with the cities of St. Pete and Clearwater. Those beaches are packed even on the weekdays I have off. The other thing I like is one of the picnic shelters there had electricity, so there was a place I could plugin my laptop. When the weather cools down I love to go to the beach and write. Now I don’t even need a plug. 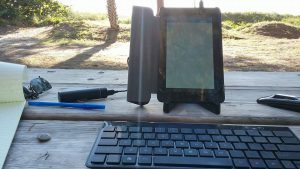 I got one of those $50 Kindle Fire tables, a Bluetooth keyboard, and an external backup battery so I can write anywhere now! I’m not sure if there are such things as power places, but I find it amazing how much stress lapping seawater and the sun sinking into the water can relieve. It’s also amazing that I can’t seem to remember it. That two hour drives seems insurmountable sometimes. Just can’t do it. Don’t have time. Well, damn it Stephen, you need it! Now that I did a rapid recharge, I can get back to working on my novella, “Storm Crow,” and await the second round with the PIA project. Fortunately, I’m subcontracting this one from someone else, so I get to spread the pain around. Anyway, Samhain last till sunset this evening (November 1st.) So have a good day. Remember the dead. Say hi to a crow. That is a great beach area. Florida native here that hardly ever gets to the beach. In fact been more since I move to the center of the state then when I lived in St. Pete. Husbands family always does Thanksgiving at Fort Desota. When the people get overwhelming it’s off for a walk on the beach all alone. St. Augustine is my favorite Florida city and it was hard seeing all the water rushing through it during Matthew. I love Ft. De Soto, but they started charging to go there now and they shut the place down at Sunset. I love swimming it the twilight. You can still do that down in Bradenton. Previous Previous post: Halloween Special: Free Short Story Collection!